I love Tandoori Chicken. It is something I often order in Indian restaurants and my wife and I almost always include it on the menu when we entertain with Indian food. 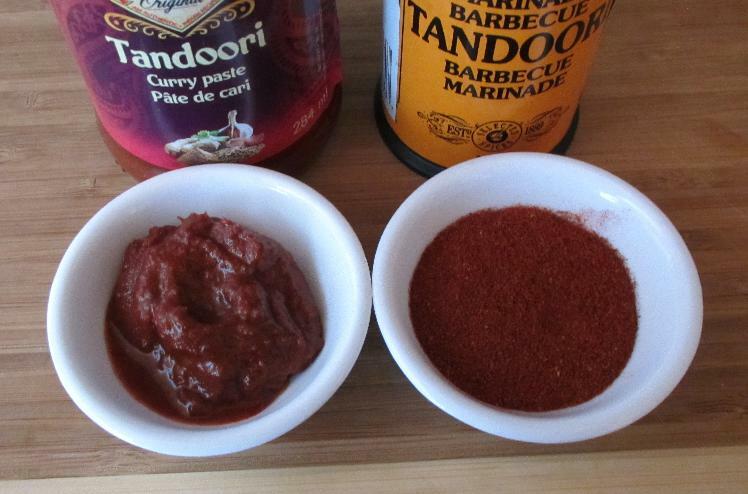 For years, I have used Sharwood’s Tandoori Barbecue Marinade for the spicing when I make Tandoori Chicken. I have made and used my own spice blends on occasion but, though some of these have genuinely been pretty good in their own right, I have never been able to duplicate (or equal) the taste of the Sharwood’s mix even though they actually list the spices used on the back of the container. Both spice blends are each properly classified as a ‘Masala’ in Indian cookery. The Patak’s version is a ‘wet’ Masala, meaning it is cooked into a paste (in this case with oil and vinegar) while the Sharwood product consists only of ground, dried spices and coloring and is thus a ‘dry Masala’. The Sharwood’s blend has a nice warm aroma in which a note of the added cumin is quite noticeable. The Patak’s variety, in contrast, is very sharp and tangy, both from the vinegar but also from Tamarind juice. Both are a fairly deep, rich red in color but the Sharwood’s also has a definite orange hint as well and is the prettier of the two, to my mind. For this taste challenge, I decided to use jointed chicken thighs; two each for the two different spice blends. 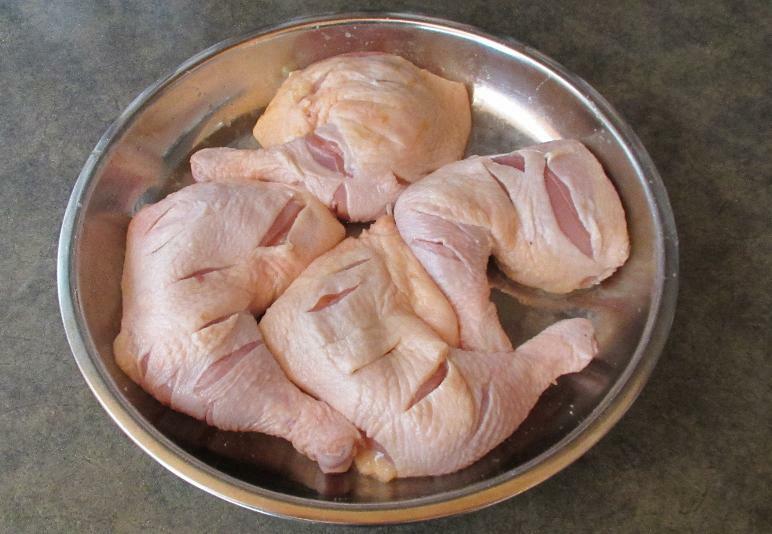 The first thing you need to do is slash the chicken pieces well to allow the various flavorings to penetrate the meat. Do a half dozen cuts or so on each side being careful to alternate the cuts in such a way that the skin will be able to come off while it is cooking. Next, rub the pieces very well with the salt and then the lemon juice. 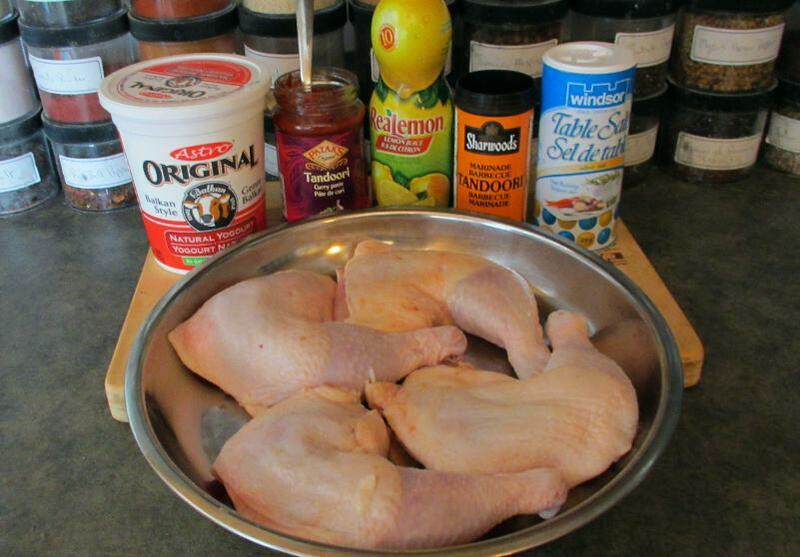 You will need about 1/3 to ½ teaspoons of salt and a teaspoon or so of lemon juice for each chicken piece. 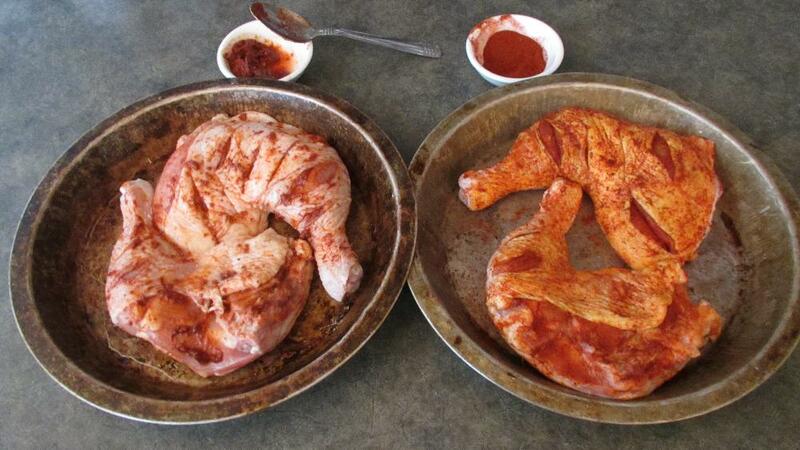 Set the chicken aside for a good thirty minutes to marinate. Now rub the spice blends well in to the chicken pieces making sure to work it into the slashes and under the skin here and there. In the picture above, the Patak’s version is on the left and the Sharwood’s on the right. I think you will agree that, thus far, the Sharwood’s is taking the lead as far as appearance goes. Again, set these aside for 20 to 30 minutes. Next, we will coat the chicken pieces with yoghurt mixed with the spice blends. For each piece of chicken you will need about ¼ cup of yoghurt and 1 to 1 ½ tsp. of the appropriate spices. 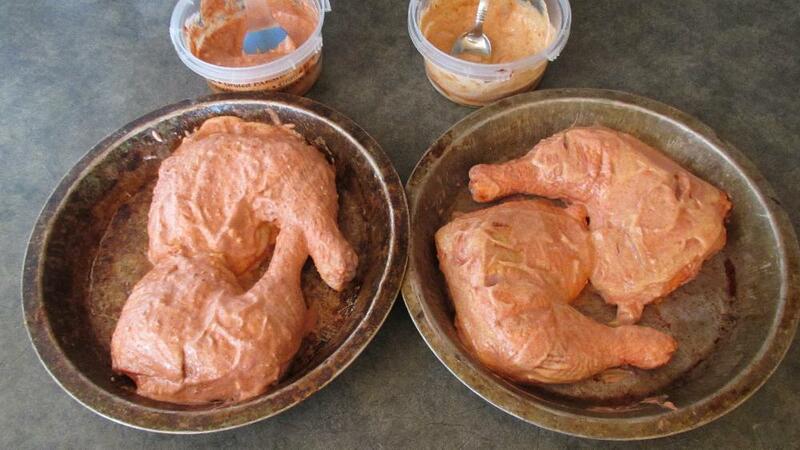 Mix these up in two separate bowls and then coat the chicken pieces using a basting brush or something similar. Make sure, again, that you work some of the mixture into the slashes and under the skin where possible. You should have a little of each mixture left after doing this but do not discard it just yet as you can use the remainder to do a final basting during the cooking process. You can now set the chicken pieces aside for an hour or two (or even overnight, if you wish). Tandoori Chicken is so called because, strictly speaking, it is cooked in an Indian clay-oven known as a Tandoor. The Tandoor can reach temperatures of 900 degrees or so and it is obviously not possible to duplicate this at home. A covered barbecue can do a good job but you can also produce a decent results in a regular oven pre-heated to 450 degrees. 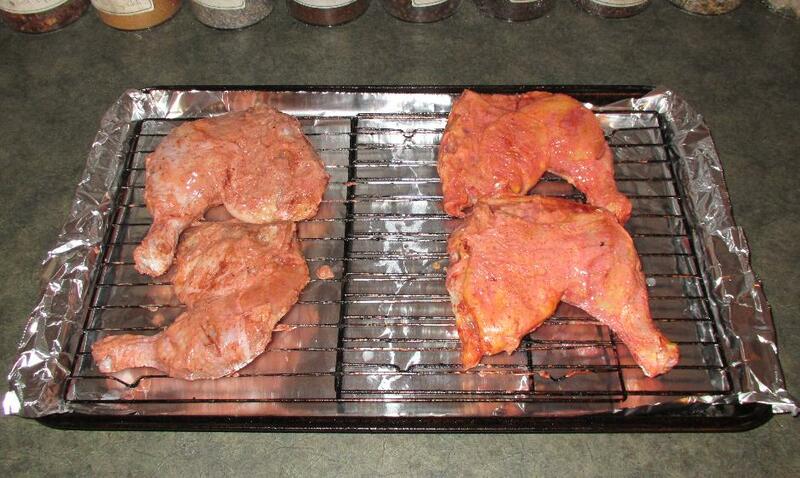 When you are ready, put your chicken pieces onto a wire grill on a baking sheet and then pop them into the oven. 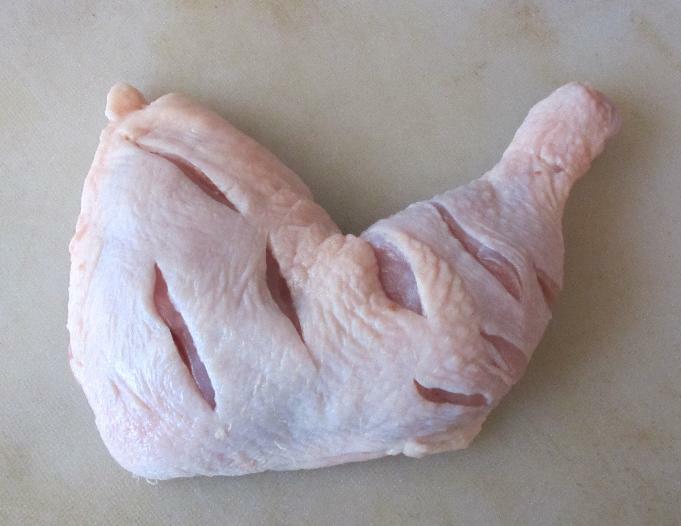 The cooking time, depending on your oven will be about 30 or 40 minutes and one way to test the chicken is to pierce the flesh deeply with a skewer or fork near the end of the cooking time. If the juices run clear and not bloody, it is done. Keep checking the pieces while cooking and turn them over at about the halfway point. 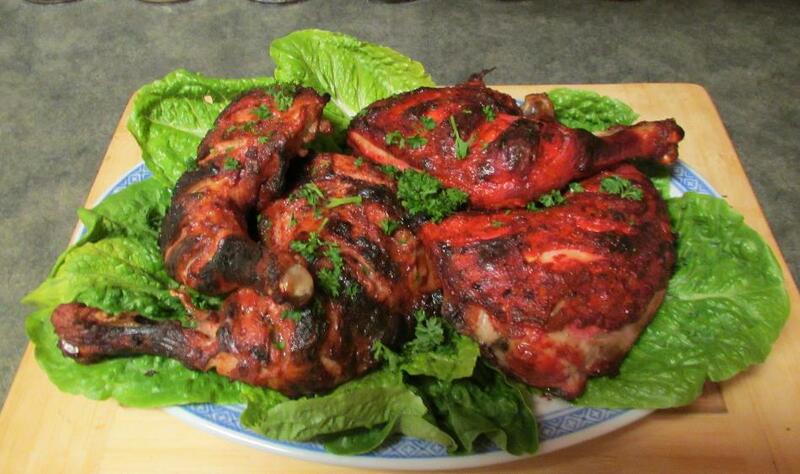 One of the features of nicely cooked Tandoori chicken is crusty, dark spots of charring. If you do not have this after the main cooking, turn your broiler on to high and then give the pieces a minute or two on each side a few inches away from the broiler element, basting further with the remaining yoghurt mixture, if desired. Keep a close eye on them to avoid burning and then remove the pieces when they are charred to your liking. Plate immediately for service. Hi! 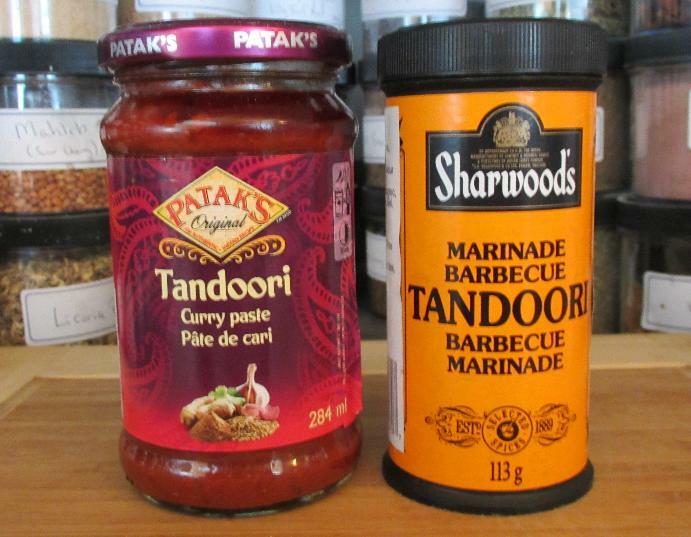 I live in Québec ( I’m french ) and could not find Sharwood’s tandoori for years now so thank you for your review for now I will be able to do Tandoori chicken again with Patak’s tandoori but out of curiosity , where do you find Sharwood’s ? YUM! Am definitely going to have to try this! A good basic blend is 4 parts each of ground cumin, coriander and paprika with 1 to 2 parts of ground ginger and, optionally, 1 part amchoor (mango) powder. Depending on your heat tolerance you can substitute some (or if you are really brave) all of the paprika with ground red chili. Further additions I like include powdered garlic, mint and fenugreek see (perhaps 2 parts for the garlic and 1 part for the rest), but cardamom, cinnamon and clove (in small amounts) are also interesting. Sometime, I have to revisit this in a blog post … why not try the four basic ingredients as a dry rub and then see if any of the other additions agree with you? Brilliant, thanks very much I’ll give it a try!! Great work, I also used Sharwoods tandoori powder but for several years now its been out of stock from Loblaws and can’t replicate the taste for some odd reason using the listed ingredients. I’ll try the pataks even though I tried it before, the ratio; paste:chicken doesn’t always work out for me, but you’ve given a valid testimonial to try again. Enjoyed your detailed comparison. I live in the mountains of western North Carolina and do not have easy access to a good Indian grocery for things like pre-packaged tandoori powder or paste, so your suggestion for a DIY tandoori mix is welcome.